This walk: 2012-8-23. 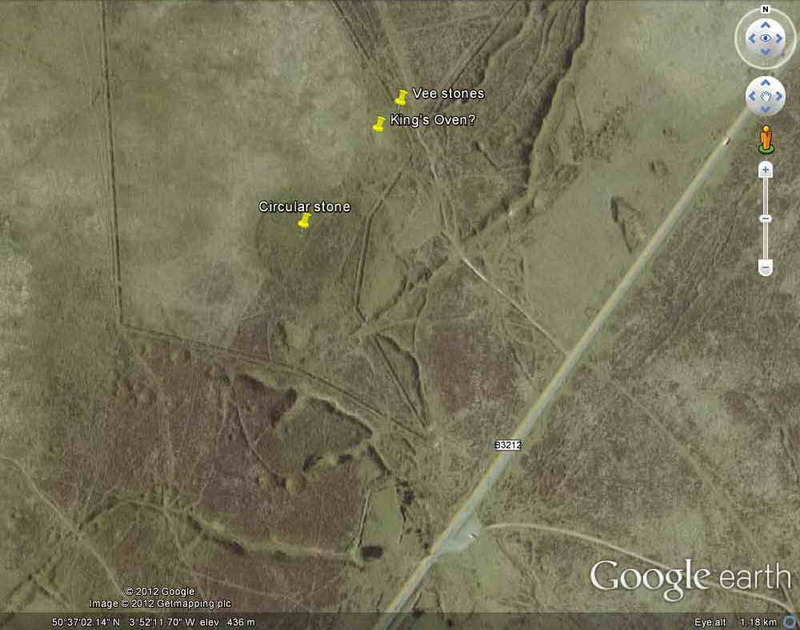 Warren House Inn, King's Oven, Bronze Age enclosure, circular stone, ruined building, vee stones, gorse, heather, ponies, Birch Tor and Vitifer Mines, Hurston Ridge double stone row, cairn. blocking stone, Assycombe Hill, Kes Tor, Water Hill, Caroline Farm, Wheal Caroline mine, shaft. Looking from King's Oven car park towards Postbridge and the Warren House Inn. Looking up a miners' gert behind the Warren House Inn, the top of the chimney is just visible on the skyline near the left edge. There is a circular structure here, a Bronze Age enclosure (clearly seen on Google Earth, see next photo), in which a pre-13th Century blowing house was reputedly situated according to some sources, known (now) as King's Oven (Latin: Furnum Regis). Not sure I believe this, because it is removed from any tin workings ...... there is another explanation for this, see 4th photo below of building remains. Notes added 1st October 2012: There has been confusion over the name Furnum Regis/King's Oven. The name is thought to have been used originally for the prehistoric cairn on the top of Water Hill, on which there is also a small, modern cairn of loose stones (see photos below). The north-east side of the cairn has a "pit" that is a stone-lined passage-way into the cairn, making it a quite unusual burial for Dartmoor, something like the chambered entrance graves seen on the Scilly Isles and in West Cornwall. The site was shown to nine French monks from Laon (between Amiens and Reims) in AD 1113, en route from Exeter to Bodmin, and described to them as the oven of King Arthur (T. Greeves, Dartmoor Magazine, Issue 39, Summer 1995, pages 6-8). The name, King's Oven, was quite soon transferred to the enclosure in the image below. The circular stone in the enclosure has been described by Robert Burnard (1888) as "It looks something like the nether stone of a crazing mill", used by early tinners for crushing tin ore. There are remains of a rectangular structure in the south-west area of the enclosure, adjoining its wall (not clear on the image below), where it is thought that a smelting furnace might have once been. The third location for King's Oven in recent times would be the rectangular building seen below (and labelled "King's Oven?") in the following image. This might have been a smelting centre of an early type, before the later waterwheel powered design. Google earth image showing the circular enclosure with the circular stone marked within it. The putative King's Oven blowing house site is also marked (see building photo below) as are the vee stones. The vee stones lay beside a reave or other old boundary wall, now overgrown. The car park can be seen at the bottom of the image. Another version of the above Google Earth view - cannot be embedded on this page for some reason. Click on the blue markers for some details. The remains of an oblong building at SX 67523 81357. This might make more sense as a blowing house, being closer to the miners' gerts. Hemery describes "A rectangular building with a central partition and some corner-stones still in situ, it has external dimensions of forty-one by sixteen feet (12.49m x 4.87m). Whether this was the smelting house it was thought to be cannot be stated with certainty" (Eric Hemery (1983), High Dartmoor, Robert Hale, London, p.706). This structure is due east of Water Hill cairn (also known as Furnum Regis = King's Oven in the past) and is 47 metres (150 feet) below the cairn, i.e. this is the location described by Hemery for Furnum Regis. This would pre-date the mechanised blowing house which started in the early 14th Century, so it would probably not look the same as the more usual type of blowing house. The Vee stones at SX 67540 81375, about 20 yards east of the ruins above, Hemery says these "may have had some function connected with the later period of mining at Bush Down tin mine" p.706. This mine is shown on the map at the bottom of this page, just across the road from Bennett's Cross car park. The colours of gorse and heather blossom. For more information about heathers, see Heather & Ling (on this web site). Looking across the road at workings on Dagger Hill of the the Golden Dagger mine (Soussons Wood is to the left, out of the photo). Three ponies against the dark green of the conifers on Assycombe Hill, part of Fernworthy Forest. Hurston Ridge double stone row, SX 6729 8250, one of the best examples of its kind, mostly in its original state. There are 99 stones arranged in 49 pairs. There is a cairn at this upper (south-west) end, visible from the blocking stone at the lower end. Orientated NE-SW. The feature is described by J. Butler (1991), Dartmoor Atlas of Antiquities II, 25.9 Hurston Ridge stone rows and settlement, pages 30-31. Southern end of the stone row - standing on the cairn. Looking up the row where the cairn is almost visible on the skyline (where the ponies are). The row is not straight. Quite near the camera various stones are seen laying across the photograph, these are part of the enclosing wall of the Bronze Age Hurston Ridge settlement. Looking down the slope to the north-east end of the row with its blocking stone. The terminal blocking stone at the downhill (north-east) end. Somewhere in this area is a "lost" cairn described by J. Butler (1991), Dartmoor Atlas of Antiquities II, 25.10 Hurston Ridge cairn, pages 31-32. The cairn was discovered and excavated by the Dartmoor Exploration Committee in 1900 and then it was "lost" again, shortly afterwards. 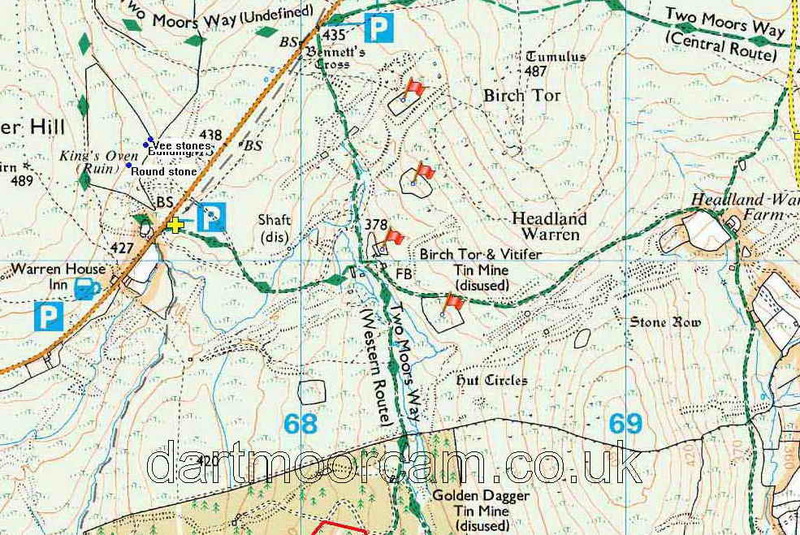 It is labelled as "Cairn A" in a map linked from Legendary Dartmoor's Hurston Stone Row web page - this places it somewhere down to the right in the above photograph, towards the disused (West Vitifer) mine on Chagford Common. During investigations on the cairn by Baring Gould, a stone axe and a cinerary urn (the latter upturned and covering a small heap of cremated bones on a flat stone, covered by a slab) were found in 1900 by the Dartmoor Exploration Committee. A photo of the restored Middle Bronze Age urn (1500-1000 BC) can be seen here (the larger of the vessels). The pattern around the rim is believed made by impressing the clay with a twisted cord. It was restored 1960-1962 and was put on display in the Plymouth Museum. According to Jeremy Butler, in the Dartmoor Atlas of Antiquities, Vol. 2, Page 31, Section 10: Hurston Ridge Cairn, the urn was found in a cairn on the west side of Assycombe Hill which is no longer marked on the latest 1:25000 map. Addendum: On 4th Dec 2010, photographs of the urn found on Hurston Ridge stone row cairn were taken in Plymouth City Museum: HERE. The urn is about two feet in height, maybe more. The museum description says it is early Bronze Age, 2010-1500 BC. A different view of the blocking stone with Assycombe Hill behind. Kes Tor, at SX 6654 8627, elevation 437 metres (1433 feet). Southern end of the stone row, showing the terminal cairn: the visible stone may be the last of a retaining circle. A broken stone axe was found by the Rev. Baring-Gould at the foot of the menhir (the tall stone on the left in the photo above). These old stones do come in handy for a good scratch! Approaching the top of Water Hill, complete with modern cairn of loose stones on top of an old cairn. Water Hill cairn, SX 6715 8129, elevation 489 metres (1604 feet). The prehistoric aspect of the cairn is described by J. Butler (1991), Dartmoor Atlas of Antiquities II, 26.5 Water Hill cairns, page 36. An unusual prehistoric grave for Dartmoor. It may have excited the medieval mind in their attempts to interpret it and given rise to the name King's Oven (= Furnum Regis). It served as a bound mark during the 1240 Perambulation of the Forest of Dartmoor. It was known by this name for hundreds of years until the name became transferred to a nearby enclosure, said to be associated with tin smelting (where "oven" = blowing house). The passage way was covered with an iron roof and used as a lookout in WWII. It has been known as Knatty's or Nancy's Castle. Looking down on Caroline Farm. There was also a tin mine in this area called Wheal Caroline. Caroline Farm building, the far end may have been the fireplace. The left upright nearest the camera has a hole completely through the stone. The drilled-through stone. The large quartz crystals in the granite indicate that the rock cooled slowly from the molten state when it was formed. Overview of the building area. Looking through the gateway into the farm. Looking back up a very wet path to where the adit is, just out of sight. Part of the complex of mining gerts that make up Wheal Caroline tin mine. A document with a map of the area can be seen HERE. Fenced-off mine shaft at SX 6708 8095. Another view of the shaft, taken from the other side. The famous three rabbits sign, beloved of tinners but also frequent in medieval times in Buddhist, Christian, Islamic, Jewish and Hindu contexts as three hares, dating possibly from Chinese Buddhism, AD 600-700. From the Warren House Inn, four enclosures (marked by red flags) may be seen as used by warreners. Apparently the southern-most one was used for growing vegetables and the others were used for growing feed for the rabbits bred by the warreners for meat for the tinners. There were several mines in the vicinity and the Warren House Inn is another indication of mining and warrening activity. The story of these fields is told by John Hayward (1991, reprinted 2009), Dartmoor 365, Curlew Publications, page 152. I remember seeing some of them clearly on a day when there was snow on the ground, back in 1979 or 1980. The legend concerns Jan Reynolds being plucked from the church at Widecombe by the Devil for playing with a pack of cards during the Sunday sermon and carrying him off - he dropped the four aces as they went across the sky and they landed as these four enclosures! 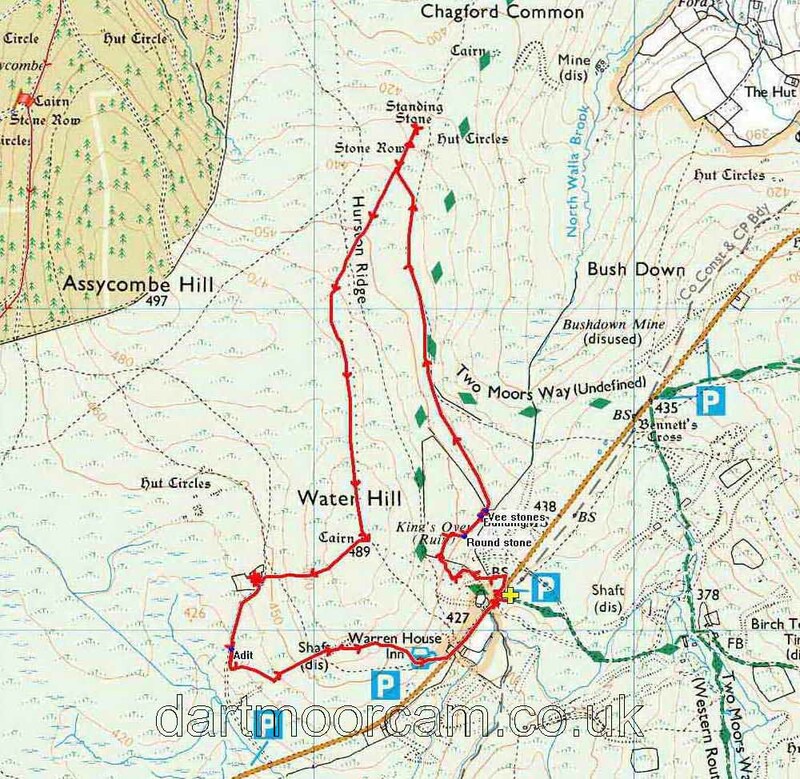 This walk was reached by driving from the Tavistock / Two Bridges direction via Postbridge towards Moretonhampstead on the B3212 and parking 200 metres past the Warren House Inn, at the the P symbol with the yellow cross on the map.